Over the course of twelve unique sessions, you’ll be joined by the most influential team of personal and professional development experts anywhere in the world. Now Featuring even more authors. Experience the invaluable wisdom and knowledge of the masters. You will be glad you did! 50 legends of success help you MASTER the 5 Fundamentals of Better Living! Gain everything you’ll ever need in life. For life! In response to overwhelming customer demand, you’ve asked us to produce one more version of one of our most life-changing programs we’ve had the privilege of creating. 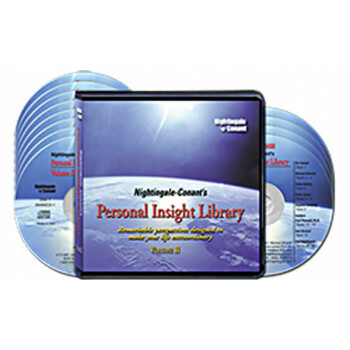 It’s The Personal Insight Library—where 50 of your favorite achievement experts give you their best ideas and strategies to accelerate your success. We were happy to oblige! Announcing our NEWEST in this wildly popular series: The Personal Insight Library Volume II: Remarkable Perspectives Designed to Make Your Life Extraordinary. These Five Fundamentals build on one another to help you form a complete life that's nothing short of extraordinary. Because once you focus on these fundamentals, in no time at all, you become a more positive, focused, and determined person. You become optimistic and creative. You begin to activate all the powers of your mind and organize all the mental laws to work on your behalf. You step on the accelerator of your own potential, and you begin achieving at a higher level than you ever have before. Today these Five Fundamentals are presented by 50 leading achievement authorities on 12 complete audio CDs. Simply listen, and they’ll help you to become 100% fulfilled. You’ll learn directly from the masters in personal development. Names you know such as Brian Tracy, Earl Nightingale, Denis Waitley, Dan Sullivan, David Bach, Jim Rohn, Dale Carnegie, and dozens more! From the first CD to the twelfth, these 50 legends hold nothing back. With The Personal Insight Library Volume II, you can listen to all 50 experts and authors anytime you want as they present hundreds of ideas to drive you faster to your happiest, most fulfilling life.